Is All Engagement Good on Social Media? Home > Blog > Is All Engagement Good on Social Media? When it comes to analyzing your company’s reach and engagement on social media platforms, what do you consider to be the most effective approach? Some companies prefer more social postings while others prefer less. Still, other companies aim for quality over quantity, sometimes posting fewer times in a day or in a week than the suggested average. In social media, as in marketing analytics overall, it is sometimes too easy to focus on numbers only. Ultimately, the goal is to engage with your audience and to create content that encourages the engagement of your audience with your brand, product, or service. It is no secret that marketing or advertising campaigns that address a broad audience often are unsuccessful. Therefore, you shouldn’t attempt to create content for everyone. Discovering who your niche target audience is and which social platforms they are engaged with the most will help you to analyze better not only how many people you are reaching with content about your brand, but also how qualified that engagement is. According to The State of Engagement report released in 2017 by Marketo, over 60% of B2B consumers think brands could do a better job of aligning their marketing goals with engagement. And over 60% of B2B consumers expected their interactions to be personalized with a brand. B2B consumers are a very tough audience as this report shows. So, how can you ensure your social media marketing efforts are not falling on dead ground? The following suggestions could help. One of the very first steps to sharpening your social media engagement efforts is by conducting a content analysis. A content analysis will help you to evaluate how your social posts are performing and understand if one type of content, for example, a video, is doing better than another type of content, such as an infographic. A deep dive into your content analysis can also help you break up content creation and evaluate engagement by gender, age, social platform, and location. For example, you might find a target audience of millennials hanging out on Instagram while a target audience of C-level executives could be found on LinkedIn. Since 4x as many consumers would watch a video about a product or brand rather than read about it, your analysis might show that video is the most compelling form of content. No matter how much or how little engagement you have, all engagement is not equal. A single share of a piece of content could be a big boost for your brand while several likes could do very little. Customers who share your content means your content is valuable enough to them to share with their audiences. Monitoring this type of activity along with comments and direct messages on your social pages is one of the best ways to gauge engagement and feedback on your brand or products as well as get the pulse of your audience. The people who are liking and sharing your content on social media might not be the desired target audience for your brand. A human resource professional who likes or even shares your post on marketing automation might not be the person you intended to see your content. While it is decent enough engagement, it pays to determine what social media channels fit your company’s brand the best. For example, for Bython Media, we did a little of investigation and came to determine that most of our target audience hangs out on LinkedIn primarily and Facebook secondarily. Almost none of our desired audience would prefer to be communicated to on Pinterest. This understanding helps us to design our social strategy and target our social posts better. Discovering the right audience who will be open to your message in the right way, at the right time, and on the right platform is a critical component for boosting social engagement. The final bit of analyzation that needs to be done is understanding who your competition is, how their content is performing on social, and how consumers interact with those brands. Some say comparison is the thief of joy, but in this case, comparison can be the giver of many gifts. Look at the messaging, the packaging, the consistent forms of content, the visuals, and the strengths and weaknesses of your competitors’ content and compare their engagement levels. Take care to pay attention to the type of engagement your competition receives as well as the type of customers who are engaging with the content. Also, seek to understand their strategy for customer relationships and measure it against your own. Taking initial steps to conduct basic analysis of both your and your competitors’ social media strategy and efforts is critical to consistency on social. 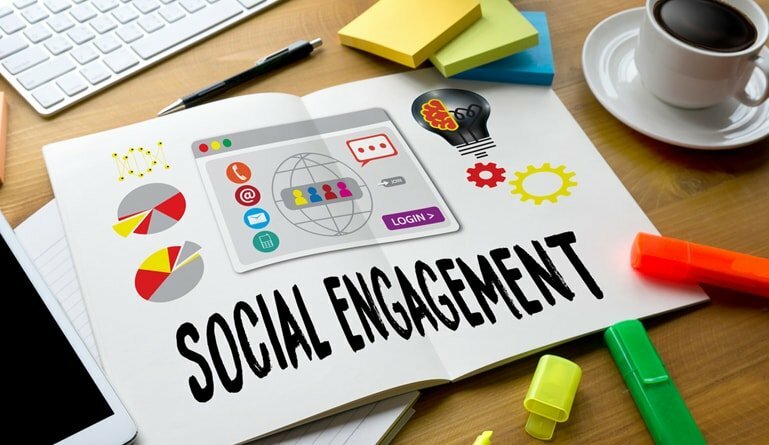 All types of engagement on social are good, but the best type of engagement is that which boosts your brand, creates loyal relationships, creates brand ambassadors, and turns social posts into money in the bank. Looking to take social media engagement to the next level? Bython Media can help. Connect with us today.